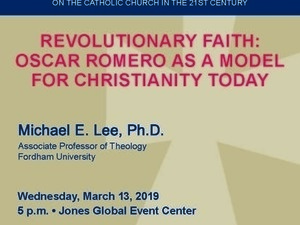 Please join St. Edward's University as we welcome Dr. Michael Lee for his presentation: Revolutionary Faith: Oscar Romero as a Model for Christianity Today. Though El Salvador and the Cold War may seem remote to us today, the legacy of St. Oscar Romero speaks powerfully to our times. This lecture will focus on how the slain archbishop’s conversion, engagement with politics, and martyrdom serve as a model for those who want to engage the pressing issues of our day with clarity and commitment.